I started this painting for my Mom when she was still in the hospital. I wanted her to have something pretty to look at when she was in her windowless hospital room. Alas, she passed away before I could finish it and give it to her. I finished it anyway: it was one of Mom’s rules to always finish what you start. She loved her garden and especially this corner where all her roses thrived. We found a list in her bedside table of all the things she loved most and her garden came in at the top after family and friends. She was particularly fond of that rose arch. The roses were especially fulsome this season and had *almost* grown all the way across at the time I painted it, so I filled it in. The prophecy was that once the roses grew all the way across the arch, a wedding would surely follow because wouldn’t it be a spectacular spot for a bride and groom to stand, underneath that lucky horseshoe of vibrant roses? The Golden Locust tree in the foreground was planted by my son and was his grandmother’s favorite tree. 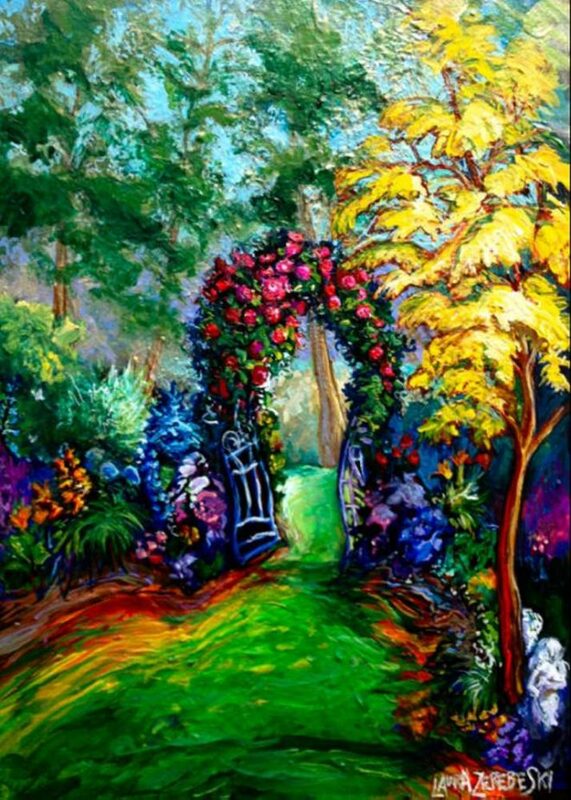 The garden is full of bright blooms – Mom loved over-the-top color – as well as a few butterflies and late-day shadows. My parents’ favorite time of day to sit and look out at the garden was first thing in the morning and last thing in the afternoon. We got to bring her home for one day before she passed so she got to see her garden like this one last time. It was one of the best days I remember.